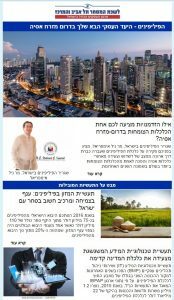 The Federation of Israeli Chambers of Commerce, a partner chamber of ICCP, has published a special newsletter on the Philippines. Made available to its 3,000 members in Israel, the country newsletter provided an overview of the Philippine economy and opportunities and challenges that one of the emerging economies of Southeast Asia has to offer. Special sections on food and information and technology industries form part of the newsletter. Food industry in the Philippines is a growing industry and an important component in trade with Israel. In 2016, Israeli imports from the Philippines amounted to $ 75 million out of a total trade volume of $ 110 million. One of the most prominent import sectors was the food industry, which accounts for about 25% of total imports from the Philippines. The thriving information technology industry is leading the country’s economy forward, a section contributed by ICCP. The IT industry and business process management services (BMP) have in recent years become the second largest source of income for the Philippine economy. To inquire about business opportunities in Israel, please contact the ICCP secretariat.